Personal attention to your Arizona Custom Labels & printing needs! You aren’t dealing with just another big corporation when you do business with Southwest Label & Printing, Inc. We take pride in our company, and we show it by paying attention to the things that are most important to each individual customer. We consider our customers be like partners — when we contribute to their growth, their success helps us to grow and achieve our objectives. Our goal is to produce a superior product at a very competitive price, and to provide a level of service which will earn your repeat business far into the future. Right equipment for small to large jobs! Our dedicated equipment is ideal for producing small to large run label jobs. We are capable of running up to eight colors and UV varnish at once, and can print on many different substrates, including various types of papers, films, or mylars. Finished labels can be up to 13″ x 27″ in size. Laminating and die-cutting is performed in-line, and we have a large selection of existing dies in stock from which you may choose. We also can produce custom dies in whatever shape or proportions you specify. 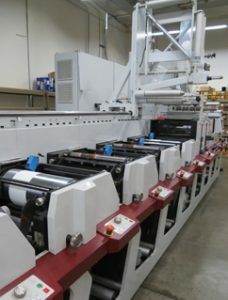 We specialize in four-color process, with up to 200-line screen. We can run either standard or digital plates capable of maintaining a 1% dot. We do consecutive numbering, slitting and scoring, over-laminating, metallics, fluorescents, foil stamping, embossing, and many other specific processes for most any type of Arizona Custom Labels you can imagine.